Getting rid of books seems the most unfaithful of acts. I imagined every book I love (which appears to be most of them) staying on my shelves forever. I never wondered what happens after forever. But we need to downsize. In the attempt to dispose of everything extra, books fall into an odd place. They are rarely extra (except badly written ones), but they keep you moored. I should be able to throw all my possessions into a backpack, then take off across the world. This is difficult when you are looking at a thousand books. The aim of a book may be to instruct, Yet you can also use it as a pillow . . . I used this quote as an epilogue for Off and Walking, a book about backpacking in America. I thought people should buy it and carry it with them and Rumi’s quote provided perfect justification. You cannot wander the world burdened by stuff. Books are unlike any other kind of stuff, but they’re still stuff. Downloading books onto a Kindle or iPad is marvelously practical if you don’t require the feel of books. I like turning pages. I like flipping back to see what happened fifteen minutes, or fifteen millennia earlier. I recently read a friend’s ebook so that I could comment on it. While the book is wonderful, it took me a long time to read because the screen got in my way. The characters, marvelously alive, were ephemeral, trapped as they were on a screen, or gone with a move of my finger. Going back to check some incident or moment became tedious. I am looking forward to the book (Lilian’s Last Dance by Christine Meyers) coming out in paperback so that I can feel it. Our library is a reasonably sized room lined with overflowing bookshelves holding a lifetime of books. I have gorgeous copies of Black Beauty and Hans Brinker that I’ve had since I was six. I had a beautiful copy of Heidi, but I gave it to a ten year old friend a few years ago. That was a good thing to do with it. That gave it continuing life. But other people, strangers, who may pick up books I’m discarding, are without connection to me. I’ll never know their response to any book. Does it matter? Probably not. Probably, wanting that thread between us is a way of clinging. And getting rid of the books is an attempt at not-clinging. It isn’t working too well. Still, I need to do this; need to decide which books go, which stay. Poetry stays. Natural history, history and philosophy books that I often use for reference will mostly stay. But fiction is hard. Several years ago I had an experience of how fiction changes so that what was once monumental becomes essentially unnecessary. When I read Madame Bovary in high school, I found Emma Bovary romantic, independent, tragic. I identified with her distaste for provincial life. Nothing seemed more provincial to me than Rochester. I thought Emma Bovary the most magnificent woman on earth, to be so torn, so desperate. She seemed the perfect model of rebellion. When I reread Madame Bovary fifteen years ago, I was appalled that any woman could be that stupid. Of course, I was reading for story, not for the genius of Flaubert’s writing. A Montana State University professor friend, who’s thesis was on Madame Bovary, and who has read the book at least 90 times, told me that, for him, Emma changed with every reading. That made me feel better, and more interested in Flaubert’s skill than in Emma’s choices, but it didn’t change my feeling that I no longer needed the book. Knowing all that, I decided to reread fiction first read long ago, then make my decision based on magic. 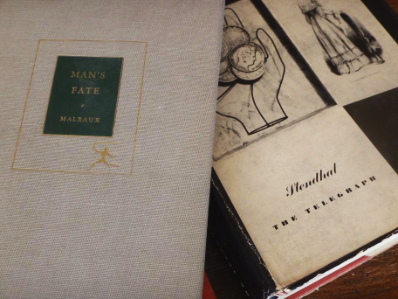 I started with Malraux. Malraux was vital to me as both writer and political thinker. Since college, I’ve moved his books from Ohio to New York to Montana to New Mexico. I wanted him near me. With him, I felt that the revolutions necessary to the heart, the mind, would always be essential. Everything that matters seemed encompassed by revolution and literary brilliance. I started with Man’s Fate, which is not very long, although extremely dense, like a really good black bread. And I found myself simply wanting to shake some sense into Kyo, to take his absolute dedication to a failing revolution and force him to acknowledge the uselessness of it. I read it through, then decided that this book (which won the Prix Goncourt) and which I thought I would never part with, now seems beside the point. So writing is not concrete. It changes with one’s own life, as much as one’s own life. Maybe all art is like that. Does work become dated because we crave something new, or because something new has already happened? I need to remember that Art and Time were also Malraux’s subjects. Maybe I just need to focus on his writings about art, and forget about revolution. Art probably matters more than revolution anyway. Art is probably as much revolution as anyone needs. After rereading Man’s Fate, without the heart to reread Man’s Hope or The Royal Way, I also decided against rereading Gide or Camus or Thomas Mann because I will not, under any circumstances, part with them. I left Marguerite Duras and Willa Cather unreread for the same reason. And A.B. Guthrie, Jr. I didn’t read The Big Sky until I moved to Montana in the early ‘80s. Guthrie introduced me to the Montana I wanted, a raw, open place where everything was possible so long as one was physically strong enough to endure. That appealed to me. Being physically strong enough to endure. Two of the books in the giveaway box cause me tremendous conflict. 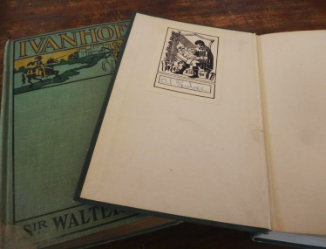 Sir Walter Scott’s The Fair Maid of Perth has a bookplate in it on which my father had written his name. Gulliver’s Travels had one with my cousin’s name. I revere my father and my cousin is my best friend. How could I part with these books? But why do I want them? For reasons of sentiment? I have the memory of my father, and the presence of my cousin, so why hold on to mementos that are not them? And then there’s Arthur Schnitzler. Viennese novelist, short story writer, dramatist, physician, genius. His writing offers everything anyone needs to know. 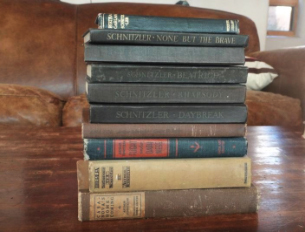 My collection of his books (in English translation) were old when I acquired them a long time ago. I’m able to part with them, but I want them to go to someone who comes to them new, preferably a nineteen year old writer.